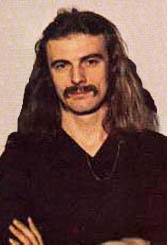 Although known primarily for his role in Yes -- a role he has maintained since replacing drummer Bill Bruford in 1972 -- Alan White had already amassed a great deal of experience as a professional musician before joining the band. Having been playing publicly since the age of 13, White moved through a number of bands during the latter half of the 1960s, including a brief period with Denny Laine in the band Balls and a prestige-boosting gig with Ginger Baker and Steve Winwood. In 1969, White received the call that transformed his career: an invitation by John Lennon to drum for the Plastic Ono Band at a show in Toronto. This led to his participation in recording sessions for Lennon's Imagine, as well as his involvement in George Harrison's debut record All Things Must Pass. Work with musicians such as Joe Cocker and Gary Wright was to follow. The crux of the crumpet was reached in 1972, when, after finishing a tour with Cocker, Alan White was contacted by Yes with an offer to fill the soon-to-be-vacant drum stool. Every subsequent Yes record has featured the sound of him hitting things. Numerous outside sessions and collaborations have taken place since Yes clamped on the irons, but only one (rather hard-to-find) solo record: 1975's Ramshackled.